This article reports on an exploratory, longitudinal study, which examined six teachers' views on the factors that affect technology use in classrooms. The research examined teachers of grades 4, 5, and 6-for three years, studying the teachers both as a group and as individual case studies. 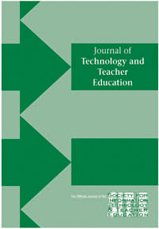 Three case studies were selected for analysis, with the aim of exploring the relation between the changes that occurred in the teachers' educational views and practices as a result of their exposure to teaching and learning with the aid of rich technology and their views on factors affecting technology integration. The findings point to two developmental patterns in teachers' views on the factors affecting technology use in the classroom: the first is concerned with the source of influence on technology adoption, and focuses mainly on the human factor; the second is concerned with the nature of the influence when using technology in the classroom, ranging from technical to cognitive transformation. The three case studies reveal three different profiles of change and demonstrate the complex relations between teachers' orientations concerning the conditions affecting technology use, and the changes that occur in teachers' views and practices. Levin, T. & Wadmany, R. (2008). Teachers’ Views on Factors Affecting Effective Integration of Information Technology in the Classroom: Developmental Scenery. Journal of Technology and Teacher Education, 16 (2), 233-263. Waynesville, NC USA: Society for Information Technology & Teacher Education. Retrieved April 23, 2019 from https://www.learntechlib.org/primary/p/22950/. Cuban, L. (2001). Overso ld and underused. Cambridge, MA: Harvard University Press. DiBenedetto, O. (2005 , June). Does technology influence teaching practices in the classroom? Paper presented a t the National Educational Computing Conference 2005 , Philadelphia, PA.
Geertz , C. (1983). Local knowledge. New York: Basic Books. Lam, Y. (2000). Technoph i l ia vs. Technophobia: A preliminary look a t why second language teachers do or do not use technology in their classrooms. Canadian Modern Language Review, 56(3), 390-420. Saye, J. (1997). Technology and educational empowerment: Students’ perspectives. Educational Technology Research and Development, 45(2) , 5-25.
International Conference 2000 (pp. 2044-2049). Norfolk, VA: Association for the Advancement of Computing in Education. Szabo, M. (2002). Educational reform through instructional technology: Part II. Development of a training system based on innovation diffusion theory. Edmonton, AB, Canada: University of Alberta, Department of Educational Psychology.